Have you accidentally lost or deleted photos from your SD card and want it back?. We have a solution, with that, you can easily recover your pictures with just a few clicks. People keep their sweat moments, happy memory and life events in the form of digital photos. What if you have accidentally deleted your photos or a virus corrupt your SD cards. We certainly can’t bear to lose our photos but if that happens Disk Drill will help you recover it. The most reliable way to keep your data secure is to take backup of your data on a regular basis and we recommend it many times. Unfortunately very few of follow instructions and take data backups regularly. If you lost your Photos from any reasons and want to recover back at any cost then don’t take any chance and choose the best sd card recovery software Disk Drill from cleverfiles. Whenever a photo deletes only the link to the photo is removed, but the actual data remains unless it has been replaced by new data. No software can guarantee 100% data recovery. However, by choosing the right tool like Disk Drill, you can increase your chances of getting back the data. Disk Drill can recover data from sd card in an efficient way whether they are recently erased or long gone. Disk Drill is a best sd card data recovery solution to recover deleted photos in a variety of different formats, from the most basic (like JPG, PNG, TIFF) to the professional ones (like RAW, DNG, R3D, etc.). It has a free version with that you can recover photos up to 500MB. But the Pro version is totally worth it which brings lots of features and Lifetime Upgrades. Disk Drill compatible with a wide range of SD Cards from Sandisk and Samsung SD and micro SD to SDHC, SDXC, and CF. Read a variety of uncommon file types, such as EXT, NTFS, HFS+, and FAT32. Support multiple OS like Windows, Mac, Android, and iPhone. Disk Drill gives you the option of a Quick Scan or a Deep Scan for more complex data loss situation. Recovering Deleted Photos with Disk Drill is very easy and you don’t need any technical knowledge for that. Before you proceed you should download Disk Drill software from Cleverfiles Official Website. You can try the free version before buying the Pro. The software is available for Windows, Mac, Android, and iPhone. 1) Download and Install – You can download Disk Drill software from Cleverfiles Official Website which is available Windows, Mac, Android, and iPhone. You have two option to choose, a free one, and a Pro version. The free version has a limited file system support and can be recovered up to 500MB of files while the Pro version has multiple file system support, recover unlimited files, and many more features. The pro version is totally worth it and I recommended to buy one. Disk Drill also works on iPhone and Android devices. However to use the app on Android device you need a Rooted device. On Non rooted device app works but recover only limited no of photos which is a thumbnail and low-quality images. It is only possible by rooting your device to recover the full-resolution of the photos. 2) Scan – Once installed you’ll first need to scan your SD card. For that, you need to Attach the device containing the SD card to your Windows PC or Mac. Launch Disk Drill and select your SD card from the list of available disks. Now click on Recover to Scan the files. 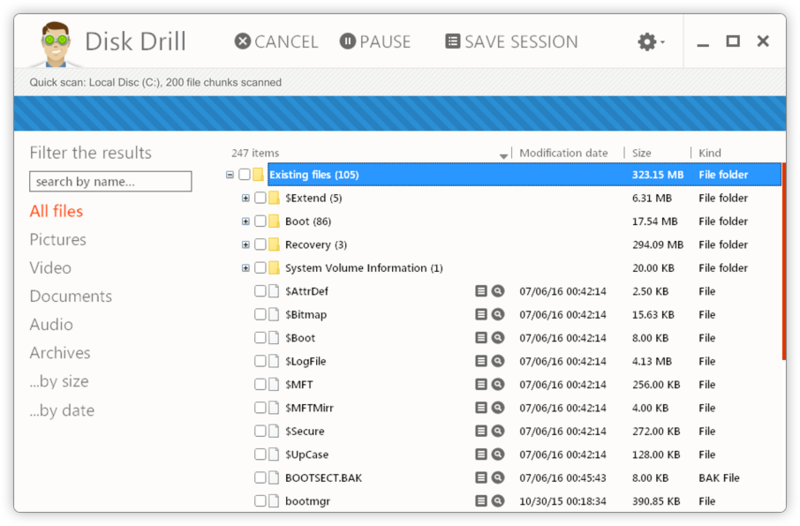 Disk Drill offers powerful Quick and Deep Scans. Quick scan is fast and recovers both recently deleted content and content on non-mounting partitions. A quick scan gives you the best result and it will return file paths and original file names. Deep Scan carefully analyzes each and every sector of your micro SD card, reconstructs deleted files based on file patterns, looking for scattered images and other files. It takes longer, but the results are worth the wait. 3) Recover – Once the scan completes it shows all the deleted and lost files of your SD Card. You can also preview the files before recovering it. Select the files that you want to recover and choose a new location in which to store them. Avoid the original location to protect from overwriting. Click the “Recover” button again to recover the selected files to the destination folder. You can easily Recover Deleted Photos With Best SD Recovery Software from cleverfiles. The software is free to use and easy to handle. We covered all the details regarding how to Recover Deleted Photos from SD card but for more detailed guide you can check the company’s official guide to recover photos.